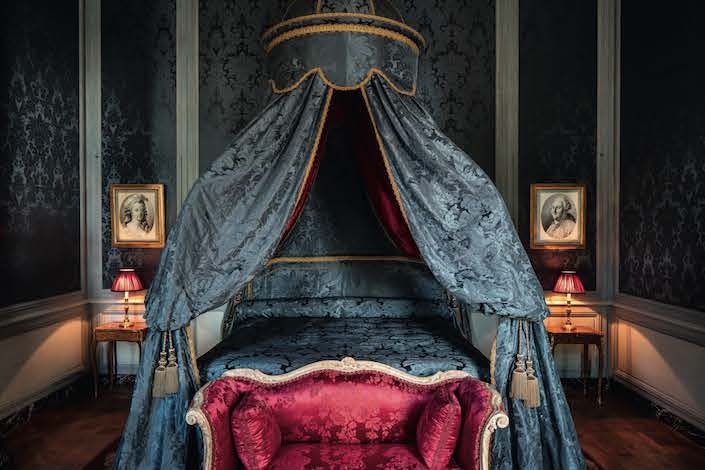 In an elegant new tome, we are first guided through the history of the chateau followed by an intimate look at the recently refurbished interiors. 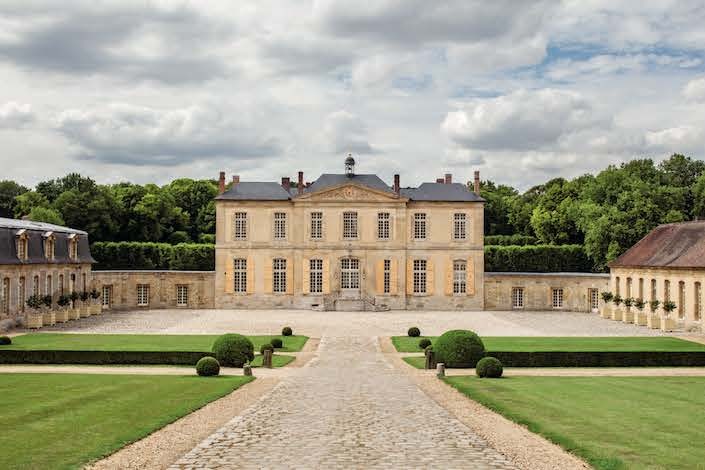 New owners, who purchased the chateau in 2011, undertook an ambition restoration of the entire estate, guided by Pierre-André Lablaude, chief architect to the Monuments Historiques and for the Domaine National de Versailles. 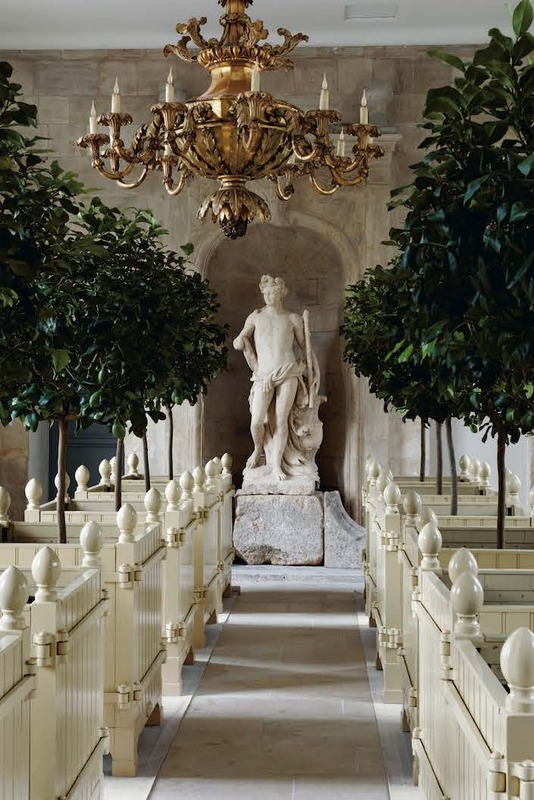 For the interiors, they turned to Jacques Garcia, renowned for not only his interior projects but his restoration of Champ-de-Bataille, his remarkable 17th century chateau. Wanting to recreate the art de vivre of 18th century France when Villette was at its peak, the new owners looked to emulate the styles of Louis XV and XVI, whose reigns covered the bulk of that era. One of the best examples of Villette’s significance is the dining room, above. Before this time, French residences of this stature did not have separate rooms for dining – Villette was one of, if not the first to incorporate such a concept. This room in and of itself represents a miniature history of French decorative arts and craftsmanship. Within a froth of rococo embellishments are also inventive developments – such as the two niches with vases from which a supply of pumped water flows. And the cartouches above reflect the new interest in the east. 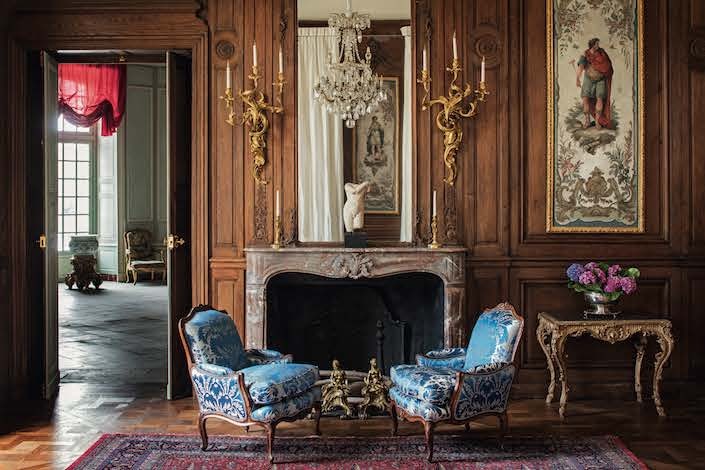 The library, with original boiserie, includes a set of mid 18th century chairs à la Reine, covered in blue silk brocade, Louis XV sconces and 18th century allegories of the Arts and Literature. In the bedroom, a lit à la polonaise is hung with bold blue damask. 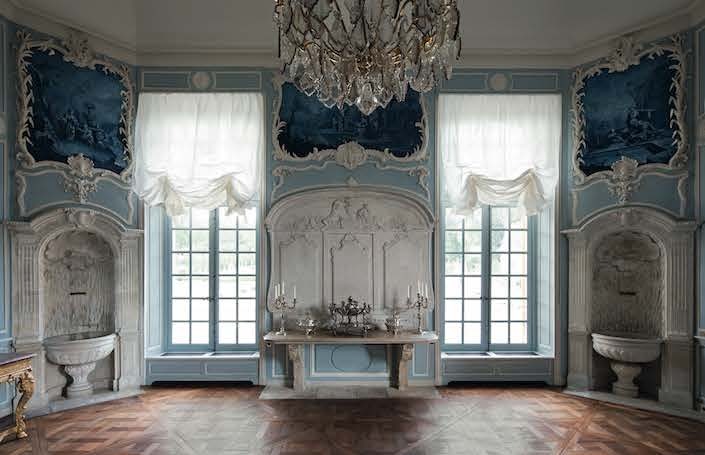 For the restoration, all the fabrics throughout the chateau were specially woven after 18th century archive documents. And it was during this era that the fashion began to decorate (almost) an entire room in a single fabric. The orangery, above, was also fully restored with its classic “caisse de Versailles” planters, originally invented by Le Nôtre in the 17th century to hold Louis XIV’s collection of orange trees, which could then more easily be moved inside during the cold winter months. 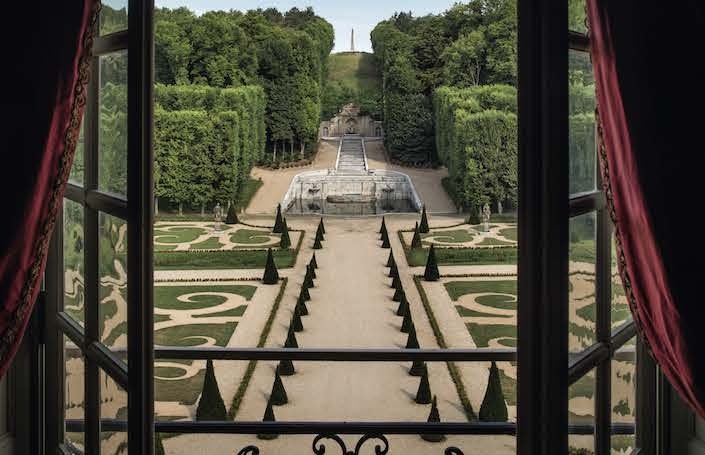 The gardens, below, as seen through the first floor apartment, were created following Le Nôtre’s principles of symmetry, offering geometric lines leading to the horizon. 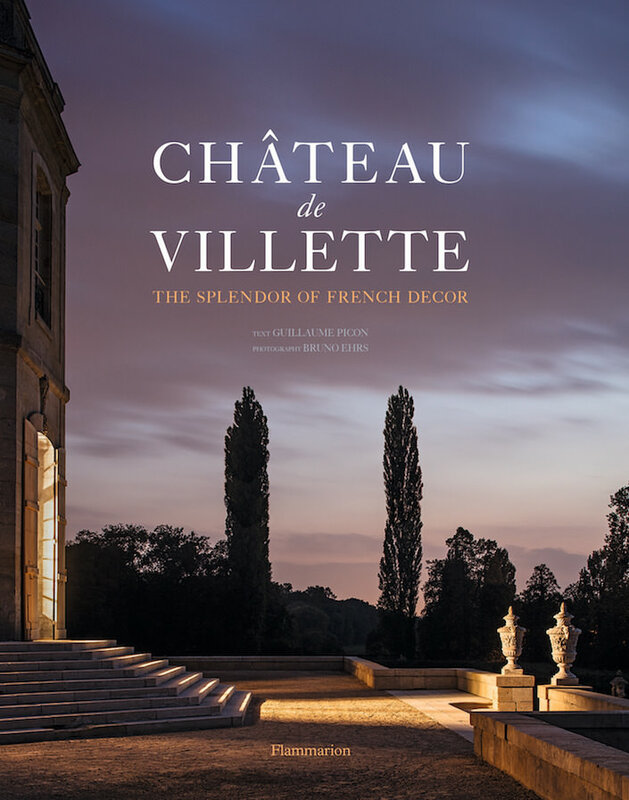 All francophiles and devotees of the French decorative history will be delighted to add this volume to their design library. This entry posted in architecture, art, art history, books, interior design. Entry Tags: chateau, chateau de villette, decorative arts, Design Books, France, french design, interior design, Jacques Garcia Bookmark the permalink. Stacey…”a froth Of Rococa embellishments”. What a perfectly brilliant description . You are a “Wonder With Words”.! Good to see the finished result of the worthy project. And what a delight those interiors are. They did it perfectly, and it’s so rare to see that these days. Thanks to sharing with us nice blog of the Château de Villette!